The Despicable Me Films introduced the world to the Minions that duly became a firm fan favorite of Both Big and Little kids alike. This makes Despicable me the perfect family attraction for most ages. 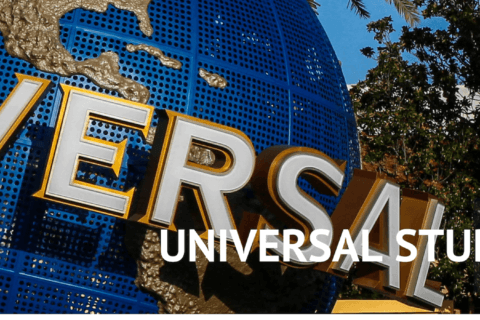 We take a look at one of Universal Studios Hollywoods premier family attraction in our Despicable Me – Minion Mayhem Review to see if the attraction is worth your time? We love the Despicable Me Films, but let’s be honest the Minions are the Stars of the show and as they are the Stars of the ride that’s fine by us. Not only are they the Staring role they are also your role as the Kids use Gru Tech to shrink you down to minion Status and let you experience the world as a small pill-shaped yellow bod! Yes, this ride is a Minion Simulator! 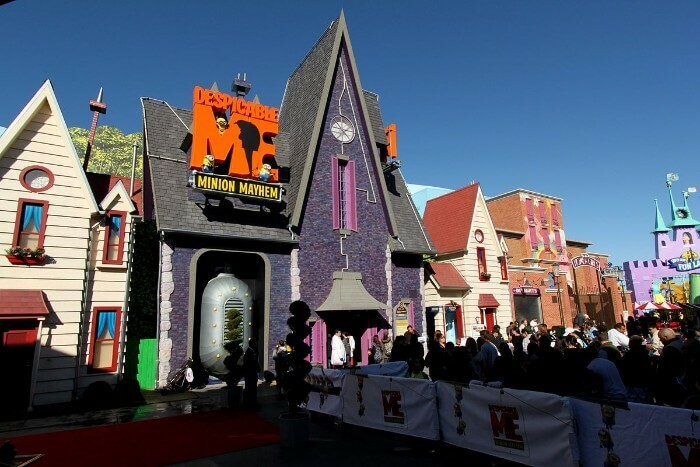 What is the Despicable Me Minion Mayhem Ride? The Ride is a 4-D Motion Simulator Theatre. The Screen uses high-tech 3-D projection requiring 3D specs the 4th Dimension is provided by giving motion to the individual banks of seat in the “lab”. This along with wind mist and water effects makes for a fun immersive experience. The Exterior of the ride is pretty awesome and has you entering Gru’s house through the front door. On busy days there is extra queuing outside to really let you take in the Excellent Exterior! Once inside you get to explore Gru’s house as the queue winds through the various rooms that are all excellently themed. Before heading into the Labs were the storyline is explained via a number of pre_show videos that really break up the queue process. Basically, Gru has a machine that will turn you into a Minion! The Ride through the lab and beyond is really good fun and uses the 3D really well. The viewpoint of a minion is a pretty unique take on a ride and allows the creators to get away with things that would be unthinkable with a human character such as insanely large drops, falls and impacts. Generally enduring things a Human Character could not. The Ride Vehicles, known as Pods, are similar to the Amazing Spider-man Ride or the Transformers ride, they seat 8 in 2 rows of 4 and are actuated on a motion platform to provide the movement. They do not roam however like the other rides and there are several Pods in the Lab/Theatre all operating independently. The Effect is pretty good with the extra large projection screen filling most of your vision and proving really quite immersive. Overall the Ride Itself is really quite good. We didn’t expect too much from it being a family ride but it is pretty immersive and the humor while almost entirely slapstick based raises quite a few chuckles. If you are Minion fans you know what to expect from the humor. It’s not intelligent humor just yellow things making noise and getting hurt. That is no bad thing, however. Have you been on Despicable Me Minion Mayhem? What did you think? Was becoming a Minion the achievement of a life dream, probably not, or did you just not get the ride at all? Did the Slapstick Jokes have you in roars of laughter of counting down the seconds before you could get out? Let us know in the comments below and if you have any questions just fire away.